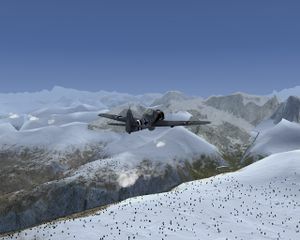 FlightGear has accurate and realistic terrain. Here are some interesting places where you can do virtual sight seeing. If you are starting with FGRun - the FlightGear launcher - you can enter the airport id and select the runway on the appropriate screen in the startup wizard. If you are starting from the command line you can use the options: --airport=ABCD and --runway=12L. Remember to give a look at the Suggested Airports page, where you can find a comprehensive list of high quality airports in FlightGear. If you enjoy these flights, please consider recording a flight and posting a link to it at the Suggested Prerecorded Flights page. 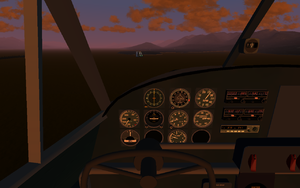 Before you start flying into one of the suggested flights, you should add both the terrain and the Objects to you FlightGear installation; This is well explained on the installing scenery page. p.s. charts are generated using FlightGear data only. This page includes the flights described on the main website and the suggested flights from the newsletters. It can serve as an archive for suggested flights from future newsletters or can give a flight if creativity is low that month. Covalis, CA. 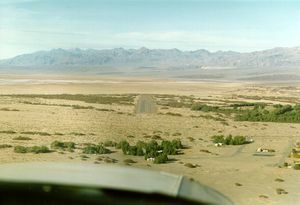 The airport is at the West edge of a 7 mile across valley. The predominant wind is a cross wind. Take-offs to the west (if they use the full runway length) often have to fly between 2 small hills and over another valley while gaining altitude. Most pilots take off to the west. It is a paved runway and quite long. It was designated as an emergency recovery field during the Cold War and was used twice that I know of by military aircraft that could not take off again from the field. Start at Half Moon Bay, Runway 30, with 32km visibility; Takeoff in the C172 and climb to 1000 feet, then continue north over the water, near the shoreline. Look out the right window frequently. Fly up the coast, overfly the Golden Gate Bridge, continue around the top of the peninsula past downtown SF, then fly on to KSFO for a landing. We now have lots to see. 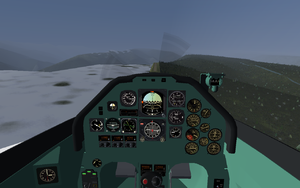 As soon as FlightGear starts, cut the power to 1500 rpm and drop two notches of flap. Maintain 70 kt. Now, pick your landing spot (a bit down the runway) and try to hold it in the same spot on your windshield. If your landing spot starts moving down, you are too high, and should cut another 100 rpm; if it starts moving up, you are too low, and should add another 100 rpm. Adjust the nose to keep your speed at 70 kt all the way down until you're right above the numbers, then cut power to idle, drop the last notch of flaps, flare, and land. Hell's Canyon, Imnaha, OR. This airport is located just west of "Hell's Canyon National Park" which has the Snake River running through it. Supposedly it's a 5500 foot drop from the top of the canyon to the river. The airport is located on the brink of this canyon. Once you clear the ridge and can see beyond it, turn right and fly a heading of about 70 degrees. You should see two shallow peaks off in the distance. Head right between these -- they are the two sides of the crater. As you get closer the shape of the crater will come into view. There's a lake there in real life, hopefully it will be there in flight gear too before long. These airports are in the vicinity of the Grand Canyon. From KGCN head north. From 1Z1 head south. From 1G4 head north (I think.) From AZ38 head north. Greenwater, WA. This airport is wedged into the bottom of a steep canyon. You definitely need to be on your toes to get in and out of here. I'd hate to think about what the wind would do to you in real life. Eatonville, WA. Start out at Swanson Airport in Eatonville, WA. Take off and fly a heading of about 90 degrees. You will need to fly for 5-10 minutes before the mountain comes into view. Be patient if you don't see it right away, it will dwarf everything in it's vicinity. Furnace Creek, CA. This starts you right in the middle of Death Valley which runs north & south. If you head south about 15 miles you'll hit the lowest point in the USA, 282 feet (86 meters) below sea level. !!! Work in progress !!! Escalante Muni Airport, Escalante, UT. This airport is east and a bit north of Bryce Canyon National park. If you head mostly south and a bit east you'll eventually hit the Grand Canyon. It is sandwiched between the Dixie National forest to the north and the Grand Staircase-Escalante National Monument to the south. There should be interesting stuff to see no matter which direction you head. Lake County Airport, Leadville, CO. This airport is at an elevation of 9927 making it a bit of a challenge to get into and out of with a standard C172. Make sure you lean out your engine before taking off and read up on density altitude before you try this one in real life. Princess Juliana International Airport (TNCM) at the isle of Saint Martin, is one of the most popular airports in FlightGear. 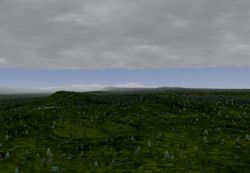 In large part due to the custom objects and land cover. However, St. Marten is only one of several detailed airports in the region - and, while the approach for TNCM is one of the most memorable in the whole world, the land cover for St. Kitts and Nevis makes it a lovely place to fly. British Airways, US Airways and American Airlines, among others, all fly into St. Kitts' Robert L. Bradshaw International Airport (TKPK) in real life. 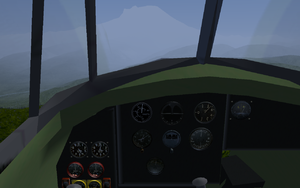 Take off from TKPK in a Piper Cub and make a northward, clockwise circle of the island. Start your descent on the east side of the island, and focus on the small hill which separates the north from the south. Start hugging the coast near the beach and look to the west - as soon as the railroad heads to the southwest, you're about ready to turn for final. Make your right hand turn for final and taxi to the terminal. If you want to fully explore this whole country, take off in a Beaver, which has a little more speed, and fly a figure eight. Take off from TKPK and circle the airport to the north like in the Cub. Then instead of landing, perform a touch-and-go and turn left over the boat terminal and make for the west coast of Nevis. Enjoy the beauty of the south coast of St. Kitts before circling Nevis. Over Nevis, you have several options - cut your flight short and land at TKPN on the island of Nevis, complete the "figure eight" by heading back to TKPK, or check your fuel and head east across the Caribbean to Antigua (which does not have custom land cover). Check out the Pilots of the Caribbean page, for further informations. 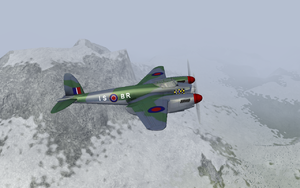 FlightGear Newsletter January 2011 by Statto, format and extended by Francescobrisa. Friedman Memorial Airport, Hailey, Idaho. This airport is nestled in a valley surrounded by significant terrain. It's one that shows up quite often in accident investigations. Jackson Hole (KJAC) airport is located at around 6,400ft right next to the Teton range of mountains. The Tetons rise straight out of the plains, gaining over 5,000ft in 2 miles. You will need the w120n40 scenery. Tower frequency at KJAC is 118.07. Due to the high altitude, you will need to lean non-turbocharged piston aircraft before take-off. Don't forget that take-off distances will also be longer. After take-off head to the North East. Grand Teton is the highest of the three peaks that rise straight from the flat-lands. Follow the line of mountains to the East, passing over Jenny Lake. After a couple of miles you will reach a huge lake. The large bulk of a mountain to the East is Mount Moran. The Teton Mountain range is surprisingly thin - really just a string of mountains running SW-NE. Flying fast jets down the steep valleys is recommended. Take a short VFR trip from Tangier Island to view the famous Chesapeake Bay Bridge-Tunnel connecting Cape Charles to Cape Henry. Depart historic Tangier Island (KTGI) situated in the Chesapeake Bay and land at Norfolk International Airport (KORF), Norfolk, Virginia. The scenic character of the flight is enhanced by leaving the island at dusk. The flight is both scenic and challenging. Frequently, when flying with real weather, you will have a steady wind blowing across the bay. Starting out quiet Tangier and arriving at busy, glittering Norfolk International (KORF) gives the flight some contrast. Before leaving Tangier: Set your altimeter to the prevailing barometric temperature. Set your communications radio to the Norfolk Intl. (KORF) ATIS frequency of 127.150 MHz to listen for weather reports in the destination area. Set your navigation radio to 112.20 MHz to pick up the Cape Charles (CCV) VOR. Set your heading bug to the runway heading, 200. Takeoff straight, flying the runway heading. Climb to 2000ft and maintain. Shortly, you should see the VOR assigned to NAV1 display receive a steady signal (the OFF flag will disappear). The DME should also settle down and display the distance to the Cape Charles VOR station. The flight to CCV will be about 26 nautical miles. As you fly, it will show your airspeed and time to arrival. It should take about ten minutes. Turn the OBS knob until the VOR displays the TO flag and 190 degrees, the heading you should now turn to. Fly south from Tangier, crossing an expanse of water, about ten miles until you see the Virginia Eastern Shore. You'll come upon the grass airstrip of Chance (VA89) a few minutes out from Tangier. Beyond are two flashing tower beacons. You may catch a glimpse of Weirwood/Kellam (W08) on the ocean shore, recognizable by two crossing dirt strips. If you look carefully, you may see the little white building that is the Cape Charles VOR station. As you fly over VOR the flag will change from TO to FROM and the needle will deflect. Do not try to follow the needle. Wait until you are past the VOR. As you cross the VOR station, you should see a highway slanting across your path toward the south west. Turn to follow this highway. You'll come across a lone tower with beacon along the roadside. You'll see an access road stretching from the tower complex to the main road. If the sky conditions permit, you may try your hand at wayfinding by following the road. If visiblity is poor, set the VOR to 180 degrees to parallel the road to the end of the peninsula. Or you can continue to fly outbound from the VOR on 190 by maintaining the same heading. The VOR needle should return to center with the FROM flag displaying. This will put you west of the bridge with a good view and the option to turn towards KORF near the initial approach fix. If you follow the highway you will need to overfly the airport, but if you stay on the 190 heading, you will be in a position to make a straight in landing. As you fly down the peninsula you'll pass Cherrystone, Eagle's Nest, Scott and Bull Farm grass airstrips. Bull Farm is the last strip before the mouth of the Chesapeake. Just past Scott Farm you should see the first glimmer of the northern leg of the bridge. The grass strips can be very difficult to see. 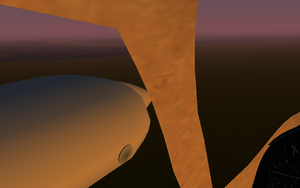 As you reach the end of the peninsula, be careful to avoid the tower on Fisherman's Island at the north end of the north leg of the bridge (Note the bridge is not modeled by FlightGear...but I hope to work up one eventually). Next comes the north middle leg. Turn right a few degrees to follow the south middle leg. Watch as the deck plunges beneath the waves to allow ships to navigate the north and south channels. As Cape Henry approaches, you'll see the Norfolk International airport to the right and the southern leg of the bridge touching the shore. If you intend to land at KORF, you will want to start your approach soon. Otherwise, you may continue to follow the bridge to the end. Make the approach to KORF by contacting the tower for vectors. Or use the ILS. This is a good flight to practice VOR flying on. It is a very straight flight path to the VOR requiring little adjustment and there are no other VORs in the area to confuse you. 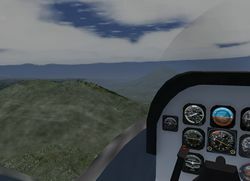 Published in FlightGear Newsletter November 2010 By Cael. It's cold where we will go so dress up warm and if we are lucky we might see whales during our flight. Don't fly too high to enjoy the amazing views, and there is a small challenge at the end. The runways we will use are long enough for bigger aircraft (7000+). Total length of the trip will be around 245 NM. So, hop in the cockpit of your favourite airliner. Alaska, here we come! Enjoy! 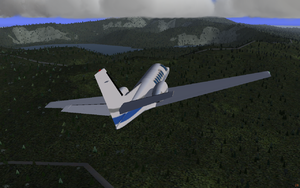 Park your aircraft on PAKT, Ketchikan International, runway 11. The wind is coming from South, change the weather if needed (SE is ok too). 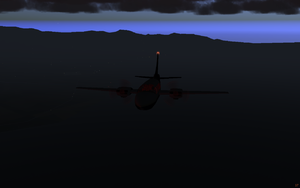 Fly North towards NDB Fredericks Point on 372.0 for 94 NM. Fly towards NDB Five Fingers on 295.0 for 39 NM. 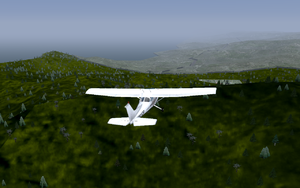 Fly towards NDB Gustavus on 219.0 for 77 NM. Fly towards NDB Coghlan Island on 212.0 for 32 NM. 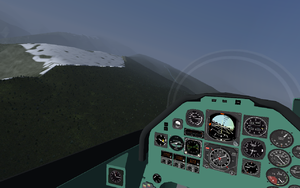 Set the ILS on 109.9 and land your aircraft (after 4 NM) on PAJN, Juneau International, runway 08. If you feel warm after this landing, you just crossed a NORAD microwave site, so that is why. With one VORTAC behind our back we do an IFR/VFR search of Wizard Island, a mysterious place, a sacred place for native Americans. You might even find the Old Man of the Lake. Don't pull up the map, that would spoil the surprise but I promise unique views. We will land on a short lawn runway. Terrain altitude will range from 4,000 to a max of 8,930 feet and down again. Total length of the trip will be about 50 NM. Select your aircraft with care. It must have one working navigational radio (VOR-DME), a strong engine, a strong undercarriage, must be capable of a good climb and a steep descend. I suggest to use Fair weather (Environment=>Global Weather). If needed remove some clouds (View=>Rendering Options=>Slider 3d Clouds to the left). Mount Scott (8,929 feet) just after depart from 2S7 (Two Sierra Seven). Wizard Island is just to the North-West of it. 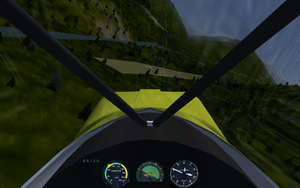 Park your aircraft on 2S7 (Two Sierra Seven), Chiloguin-State. Set NAV1 on 115.9 (Klamath Falls VORTAC) and on radial 323o (Magnetic). We are at an elevation of 4,217 feet. Set QNH. Set heading bug at 275o (Magn). Take off an fly the course set with the heading bug. Monitor distance and you will find Wizard Island at 50 NM from Klamath Falls. The island has an elevation of 6,673 feet. I suggest a full 360o turn, take pictures. Set radial 318o, keep the same frequency. Do a new radial intercept. 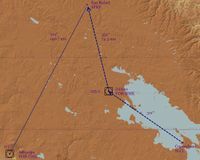 Try and find the airstrip (3S6, Three Sierra Six, Toketee-State) at 71 NM from Klamath Falls with an elevation of 3,361 feet, runway heading 275o (Magn). There are bumps around you should avoid. If you are capable of finding the island, finding the airstrip and landing without a crash, in one go..., you are a wizard. Click this link after you have landed so you know what amazing landscape you have seen. December 2011 by PH-JBO. Published Newsletter Match 2012. 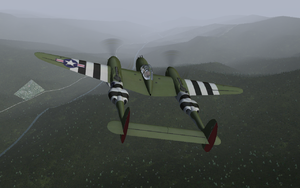 Gary Carvell: Here is a suggestion for the FlightGear Places to Fly page. I don't have any particular routes, just fly around and enjoy the gorgeous scenery. These three airports are in the same region of the very southern tip of Argentina. This area is a scenic wonderland - a maze of islands, mountains, and ocean channels. Hours of entertainment. SCGZ - Puerto Williams Guardiamarina Zanartu Airport, Chile Located on the north coast of Isla Navarino facing the Beagle Channel. At 55 deg S. longitude, Puerto Williams is considered the southernmost town in the world. SAWH - Ushuaia Islas Malvinas Airport SAWO - Ushuaia Est Aeronaval Airport Ushuaia, on the south coast of Isla Grande de Tierra del Fuego, on the the Beagle Channel. I personally like to fly this area in the Catalina, it's a great sightseeing plane with the advantage that you can take off and land just about anywhere. Bolivia to Peru. This trip will lead you over one of the highest and deepest lakes in the world towards the highest airfield in the world. It a demonstration of a IFR flight towards a fix and a demonstration how accurate FlightGear simulates air density and the effects it has on aircraft. Place your aircraft on the airfield SLCC, Copacabana, with an elevation of 12,592 feet. 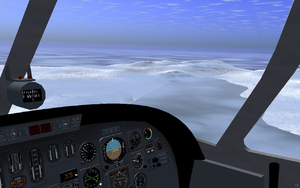 FlightGear will show snow all around you but that is not very realistic so let's clean up. 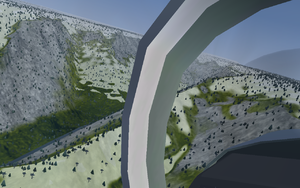 View=> Rendering Options=> Snow line=> Set to max. (5,000M). We will fly towards and land at SPRF. If you would enter SLCC and SPRF in Kelpie planner you probably would not be able to find SPRF. To find SPRF I am adding an additional VOR-DME station and for a good fix give you another VOR-DME. Try Kelpie planner to plan this route and compare with this suggestion. Equipment preparation. Set NAV1 to Juliaca VOR-DME on 155.55 with a radial of 311° (magnetic). Set NAV2 to Arequipa VOR-DME on 113.7 with a radial of 212°. During our flight we will fly with true altitude as set with QNH, keep QNH updated. Arm the autopilot with the heading bug at 311° and an initial altitude of 13,500 feet. Take off and if you took the wrong RW pull up hard. Take a small tour over lake Titicaca, see the floating islands and try to find the lost golden treasure. Intercept the nearest radial on NAV1 towards Juliaca (about 311°). Just before Juliaca is a hill so while on lake Titicaca increase altitude to 14,200 feet, the VFR part of this trip is over. After passing Juliaca set the radial of NAV1 to 352° and set the altitude to 17,422 feet. We will fly from NAV1 and slowly increase altitude. At a distance of about 60 NM set the heading bug on the current course. Monitor the distance to NAV1, the radial of NAV2 and the distance to NAV2. At a distance of 74.5 NM to NAV1, a distance of 140.7 NM and at the radial intercept of NAV2 should be the runway. So, from 60 NM onwards, look outside the window, then at NAV1 and then NAV2 etc. If you are at 80NM to NAV1 you have missed the airfield but you still won't hit any hills (unless you bank left). Bank right and set the heading bug to 172°. Fly back towards NAV1 and intercept the radial 352° at about 50NM again to repeat the search. The runway SPRF, San Rafael, has a elevation of 14,422 feet and a heading of 297°/ 117°. Our initial altitude has been set 3,000NM above the RW elevation. That should give sufficient room for navigation. After you have seen the airfield set the radial of NAV1 to 297°, the heading of the runway (not the course to the runway) as a visual aid. Land on RW 30 (and not on RW 12 unless you are a show-off). Oh, there is a small hill in front of RW 30, just so you know. Decreasing speed at this altitude can be a bit tricky. The air is thin and does not give much resistance. Next to that, the difference between indicated airspeed and ground speed is very noticeable. The ground speed is much higher as the indicated airspeed. After a successful landing, try to discover the origin of the Amazon river since we are now at the starting point of that trip. October 2011 by PH-JBO, published in Newsletter February 2012. Peru. For this IFR tour (with VFR parts) we take off from the highest airfield in the world to discover the origin of the Amazon river in South America. I promise spectacular mountains and valleys. The total length of this trip is about 175 NM. Place your aircraft on the airfield SPRF, San Rafael. 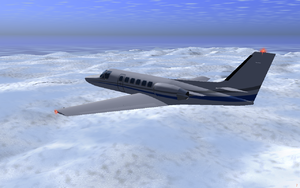 FlightGear will show snow all around you but that is not very realistic so let's clean up. View=> Rendering Options=> Snow line=> Set to max. (5,000M). Equipment preparation: Set NAV1 to Arequipa VOR-DME at 113.7 with a radial of 176° (magnetic). Set NAV2 to Cusco VOR-DME at 114.9 also with a radial of 176°. Set QNH and during flight keep correcting it, it's a bad idea to use Pressure altitude during this flight. Set the heading bug to 250°. Arm the autopilot and set the initial altitude to 16,000 feet. The airfield SPRF, San Rafael has an elevation of 14,422 feet. That altitude will cause problems during take-off. It takes a lot longer for the aircraft to gain sufficient speed for take-off, also the take-off speed that is needed is higher as you would expect. Perhaps an additional notch of flaps is needed. 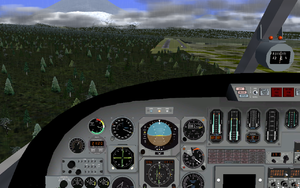 Take-off, avoid the bumps (there are plenty) and fly a course of 250°. After about 80 NM you will fly over the radial of NAV1. Intercept the radial towards Arequipa. At a distance of 75 NM towards NAV1 you will have to increase altitude to 19,000 feet. At a distance of 50 NM towards NAV1 and 118 NM from NAV2 you will see and cross over the mountain Nevado Mismi with an altitude of 18,362 ft. The rains and water on the area to the right until Nevado Mismi will leave towards the Atlantic ocean through the Amazon river. Anything to the left and after Nevado Mismi will leave towards the Pacific ocean. After Nevado Mismi you are tempted to descend. Don't. Just before the airfield is Mt.Chachani with an altitude of 19,872 feet and to the East is the active volcano El Misti with an altitude of 19,101 feet. 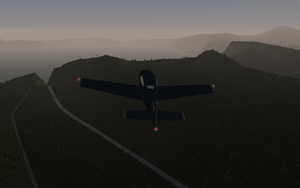 You can either increase the altitude and fly over the airfield or keep the altitude, even descend and fly between the mountains, your choice depends on the visibility. Fly using the heading bug and set NAV1 to ILS 109.7 with a radial of 93.2°. 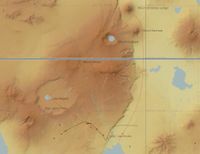 We will land at airfield SPQU, Rodriguez ballon, that has an elevation of 8,405 feet. There is a reason this airfield has just one ILS. The area South-West of the airfield is below 11,405 feet and is safe to navigate. Position the aircraft in front of the runway at an altitude of 11,405 feet, catch the glidescope at a distance of 9.5 NM and land your aircraft. After landing and parking your aircraft crawl into the tower to look around. October 2011 by PH-JBO. Published Newsletter May 2012. I recomend a powerful jet angine airplane, but not too heavy ! Dead Sea is the lowest water elevation on the Earth. Take off from the Beer-Sheva Teyman airport and head East-North-East. About half way there, after the southern Hebron mountains ridge, there'll be a sharp drop-off down to the Dead Sea --- the lowest exposed point on the Earth. It's really fun to descend and explore the beautiful coastline. In the real life, you wouldn't like to fly low over this water there of your own will --- while you don't need a life vest in the Dead Sea, the water is pretty caustic there for one's eyes. Once you're done marvelling the sights, continue on to the Queen Alia airport. landing in the dead sea, notice the altitude ! landing at Queen Alia Intl. See article: Edinburgh to Oban. The west coast of Scotland offers some stunning scenery and a number of small airfields and airports to land at on both the mainland and the small islands the dot the coast. The distances between the various airfields are quite small, and some of the runways are on the short side, so STOL or GA aircraft are ideal. The tour suggested here follows part of a microlight trip I made this month, photos of which can be found here. Oban airport (EGEO) lies on the west coast of Scotland, and offers fuel (both AVGAS and AVTUR) and a North/South tarmac runway. From Oban it is just a 10 minute flight west to the grass airfield of Glenforsa (EG45), on the north-east coast of the island of Mull. Due to the hills and water channel, this airfield often gets quite strange wind patterns - the weather can be perfect in Oban, but much gustier and windier at Glenforsa. At times the windsocks at either end of the runway can blow in completely opposite directions! Some distance north of Oban lie the airfields of the Isle of Skye (EG57) and Plockton (EG81). This is an excellent place from which to explore the mountains of the Isle of Skye, known as the Cuilins. Heading south from Oban, one can follow the coast to the island of Jura, with it's distinctive hills (The Paps of Jura). From Jura one can head south to the island of Islay with its numarous malt whisky distilleries (many of which are modelled in FG). Islay Airport (EGPI) has extensive runways. From Islay head north east to the tiny island of Gigha. 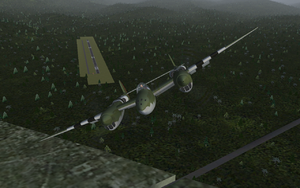 Despite it's small size, it too has an airfield (EG44), though the FG version is tarmac rather than grass. From Gigha head east over the Mull of Kintyre, to the hilly isle of Arran, then north east to the Isle of Bute. Both islands have very small grass airstrips, which are sadly not present in FG. From Bute you can head south east to Prestwick International (EGPK), famous for being the only place Elvis touched down in the UK, and a fine place to end our tour. Edinburgh Airport (EGPH) is located to the West of the city of Edinburgh and south of the Forth rail and road bridges. You'll need the w010n50 scenery and the latest set of objects from the scenery DB which include a number of models for the Edinburgh area. From Edinburgh Airport, head north and circle the bridges, then follow the coast on the south eastwards past Edinburgh (watch out for the Castle!) and to East Lothian and Bass Rock - a volcanic plug in the sea that is host to thousands of sea-birds. There are a number of sights in East Lothian, include a distillery. If you wish to continue your tour, head back North, crossing the Firth of Forth to the Kingdom of Fife. Head approximated North West, tracking towards the Perth VOR (110.4). There is an airport here (Perth Scone, EGPT), but instead we will now track out on the 090 radial and pick up the ILS to Dundee Airport (108.10) landing beside the sea. Take-off from Grenoble le Versoud (LFLG). Head south following the general direction of the Alps. Bearing left (East) will take you into high alpine territory, while towards the West lie the plains of the Rhône valley. Once you reach the Mediterranean coast, follow it to land in Marseilles (LFML), Nice (LFMN), or another smaller airport serving the French Riviera. Published in Custom France Scenery. 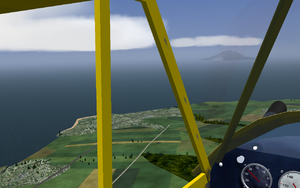 Take a VFR sightseeing tour over the Gulf of Finland from Helsinki to Tallinn! Estonia's landmarks are all recent additions, while Helsinki was one of the first cities to have original models in the scenery model database. 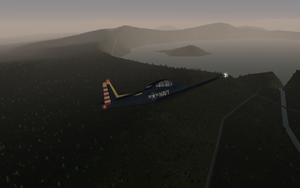 Take off from the smaller EFHF airfield in Helsinki, or try your luck fighting the virtual traffic at Vantaa, and head toward the port of Helsinki. Look for the Hartwall Arena, the Pasila tower, the railway station and the Olympic Stadium along the way. Make your way out over the Gulf flying just west of south - a heading of 190 should set you up nicely for a sightseeing tour of Tallinn. Try to come in from the west and do a sweeping left turn over the capital of Estonia, looking out for the Swissotel, Olympic Hotel, the Television tower, and other important landmarks in the capital city of Estonia. Make sure you look out for St. Olaf's Church, the tallest building in the capital city. Make your way over the Ulemiste Jarv (lake) to land on runway 09 at Tallinn's main airport. 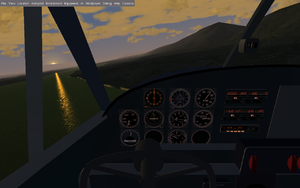 If you desire, you can do a touch-and-go at Tallinn and set your course southeastward, landing at Tartu Airport, which is also modelled in FlightGear. The distance between Helsinki and Tallinn is about 50 miles or 80 kilometres, while Tartu is twice the distance from Tallinn at 100 miles/160 kilometres. Fly a heading of 135 to get to Tartu from Tallinn. Published in FlightGear Newsletter October 2010 by Statto. The Azores, set in the middle of the Atlantic ocean, has had many names. Fortunate Isles, the Blue Islands, the Islands of Tin and Silver, the Islands of the Seven Cities. We can add, the Islands of Amazing Sights and Flights. 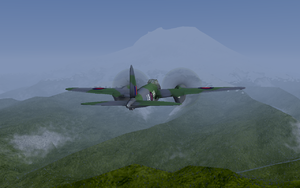 Our flight is to celebrate the amazing views FlightGear can give us. 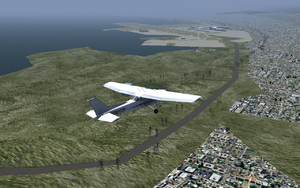 Start your plane at Lajes Field (LPLA). This once was an emergency landing site for the Space Shuttle so you will have plenty of room to take off. We will have to fly an odd pattern. The reason for that: if you don't fly too high (stick around 3000 while you can) you will have some amazing views. Next, fly towards and over LPPD. Look out the window and enjoy the view. Then head out towards LPHR. If you feel LPHR coming near, look out the window good, you might have to pull your plane up. An archipelago in the middle of the Atlantic sea, stunning beauty where you won't expect it. Seven islands, seven continents, thats what the canarian people say. And it's true, you will face seven totally different islands and nine different airports. Take off from the largest one, GCLP, at the main island Gran Canaria. Leave the beautiful island heading to the west, and land at GCTS, the southern airport at Tenerife. Enjoy the view on Spains highest mountain, the glaciered Teide, when flying to La Gomera (GCGM), one of the greenest islands there. Master the short runway, and enjoy the view, before taking the challenge and approach El Hierro (GCHI). A short runway, with cliffs and rocks on both ends will cause you to sweat. From this island, which was claimed to be the western end of the world in medieval times, you'll turn to the beautiful and wild island of La Palma (GCLA). The next approach will be historical, because you are approaching the notorious Tenerife North (GCXO). Yes, I am serious, you will face that airport, where the worst civil plane crash ever took place. But you needn't worry, if you got that far, you will do this approach as easy as any other. The longest flight on your trip will take you to the eastern island, Lanzarote (GCRR). Take a look at the volcanic-red mountains, the vineyards, and the beaches. You want more beaches?? Depart to the south-west, fly over the small island of Los Lobos, and land in the holiday-paradise Fuerteventura. Enjoy dunes, bays, and very nice long beaches, before you finally touch down in Fuerteventura (GCFV). You want to stay? Okay, let's taxi to a parking position, and cut off the engines. If you still want more, fly back to Gran Canaria's GCLP, where we started our trip. Traffic lights turn red, gates are closed. The only busy main road to the peninsula is closed and all the cars and trucks are waiting patiently. Waiting for a train to pass? No. Waiting for a plane to pass since the main road crosses a busy runway. On both sides water and being crossed by a busy main road can only be one runway: Gibraltar airport! One would expect an ILS installed on such a tricky runway but no, you will have to guess where it is and how far away it is. Not even an ADF points to it. Take off from LEMG (Malaga). Go South-West and find the runway of LXGB somewhere to the right of the rock. Happy guessing! Surrounded by spectacular mountains and nestled in the end of a valley, Khorog Airfield (UT1C) makes an interesting place to land. It can only be approached by flying down the curved valley that snakes in from the North. Flying from here to OPCH (Chitral, Pakistan) at around 500ft AGL all the way is a wonderful way to explore the Hindu Kush mountains. 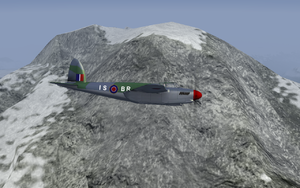 If you bring a piston engined aircraft, be prepared to adjust the mixture as you climb - at the highest point in the flight, you will be at around 22000ft. 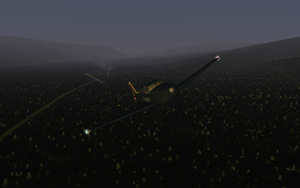 Also, don't forget to carry plenty of fuel - there are very few airfields in the Hindu Kush that exist in FlightGear. This is a scenery bug that will hopefully be fixed in the future. October 2011 by Armchair Ace, published in Newsletter January 2012. Let's explore one of the highest regions of the planet - the central Karakoram with the densest concentration of mountains of 8000 m and above. We're going to need a good climbing performance for the trip - even the frozen plateau of Baltoro glacier, above which K2 and Gasherbrum V and VI loom, is more than 13,000 ft high. Take off from Skardu airport in Pakistan (OPSD). Skardu has a reasonably long (11,944 ft) runway at just 7,316 ft elevation, so you can take a jet, but for instance the Twin Otter is more stylish. South of Skardu lies Deosai park, a famous high plateau, but we turn initially east. There's a chain of lakes which is the Indus river. After about five miles, the Shigar river merges with the Indus. Turn slightly left and follow the Shigar, then follow it into a long and broad lake-filled valley stretching into north-western direction. Towards the end of the lake, a small tributary river, the Braldu, turns eastward out of the main valley. Follow the Braldu and start climbing (if you haven't done so yet). About 15 miles after turning into the Braldu river valley, two glacier-filled valleys stretch to the north - admire the view! Passing a few lakes, you reach finally Baltoro glacier continuing the river valley stretching eastward. Ever climbing, follow the glacier till you reach some kind of T-junction. 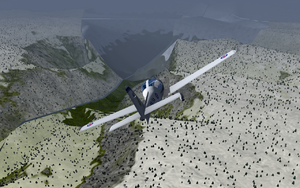 The glacier arm reaching north leads to K2 (which sadly isn't really there in Flightgear), but just ahead of you are the still rather impressive peaks of Gasherbrum V, VI and I - circle the range and make some pictures! A good way back to Skardu is to go about 10 miles sourth from the Gasherbrum peaks, then head due west. To your west, you can see the long valleys fall away from the high ranges, to your right is the still glacier-covered high Karakoram. On a clear day (really good visibility selected) you can see the distinctive peak of Nanga Parbat appearing straight ahead on the horizon. 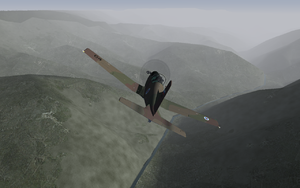 The valley of Skardu is quite a distinctive feature and finding back VFR should not be a problem. Published in Newsletter April 2012 by Thosten. For this VFR trip we need a strong machine since we will go up from 4000 to about 10,000 feet and since we are in Africa, Tanzania , what better choice is there as the Cessna 208 Caravan, on wheels. We will take off from HTLM, Lake Manyara, runway 12 (124.5 deg), that has an elevation of 4150 feet. Hit Shift-B so we don't drop off the runway. We will have to change some settings before we take off. There is no snow where we are so: View=> Rendering Options=> Snow line=> Set to max. (5000M). We need a reasonable clear sky since there are quite a few bumps we could hit: Environment=> Global weather=> METAR source=> Fair weather. Give full throttle and take off. Bank left and make a full circle so we gain some altitude and make a mental note of the airstrip, since this is the only one nearby. Look at the road West towards the airfield. You will notice that the airstrip is at the edge of a mountain ridge, the lake to the East is quite a lot lower. We pass over the airstrip towards lake Manyara and turn left keeping the mountains close to our left side, on an initial course of about 30 deg. We keep the mountains to our left and follow our path, our heading will slowly go from 30 to North and takes about 15 mins. During our path we should slowly gain altitude. On the image we see two distinct mountains. The nearest is Mt.Kerimasi, a fun place for hang-gliders, and North Mt.Ol Doinyo Lengai, an active volcano. We are heading straight towards Mt.Ol Doinyo Lengai. Just before we would collide we take a sharp left turn heading 225. You will see why we need the altitude now. The mountain ahead, Mt.Embagai, we see does not appear to be anything spectacular. Aim towards it since we have to go over it. Coming nearer, if you are high enough, 9000 feet, you will see why this mountain is well worth a visit. It is a crater with a lake inside, lake Embagai (Empakaai). Enter the crater and look around, careful not to loose any height since we'll have to get out again, we need about 10 000 feet. Mesmerized we grab our compass and take a course of 225 again. To get out we might skim against a cloud, be careful. If you don't see a way out take a turn again to wait for the clouds to move out of sight. After you managed to get out of the crater keep on the course of 225 while descending slowly for about 9 mins. There are some bumps to avoid, like Mt.Olmoti we keep to the right and Mt.Losirua on the left. After a small hill we enter one of the most amazing places in Africa, the Ngorngoro Crater, the second biggest crater in the world. A micro climate and amazing wildlife. Examine the crater and you will notice two lakes, head towards the biggest lake, lake Magadi. When you are above it take a course of 123 to get out of the crater. After leaving the crater it takes some time before we are near the airstrip again. After about 5 mins we will see a river (left) and a road (right). Follow the road since it will lead us to the airstrip again. Landing 124.5 deg 4150 feet. October 2011 by PH-JBO. Published in Newsletter December 2011. We have to take a big airliner for this trip. The runways are long enough but for this trip we need some altitude and a slow descend. We park our Big Bird at HCMK, Kisimayu, Somalia, near the East coast of Africa. It's unsure what this airfield is used for but it's a long piece of tarmac. I could not find regular flights to and from this airfield, not so strange, there is no lighting, no radio beacons and... no fuel. What you can find is Global Air Rescue that has an air ambulance service based here (with a Learjet 35). Our route will be around 425 nm in length. You know your aircraft and know what altitude you will need to fly. Our destination, HTKJ, Kilimanjaro, Tanzania, has only one ILS and I have learned, if an airfield has only one ILS there is probably a reason. HCMK Kisimayu, length 12,177 ft, no navaids near. GAR Garissa VOR-DME freq 115.7 heading 268° dist 169 nm. KB Kilimanjaro NDB freq 393.0 heading 224° dist 258 nm, here is the holding pattern for the Kilimanjaro runway (and there is a 19,000 ft reason for this detour). KV Kilimanjaro VOR-DME freq 115.3 heading 70° dist 26 nm. HTKJ Kilimanjaro ILS freq 110.9 runway heading 88° elev 2,900 ft AMSL length 11,807 ft. Prepare your flight well to receive amazing views of the landscape during the final steps of the route, if you don't you will discover why some pilots call Kilimanjaro Kill-You-Manjaro. Youtube video: Kilimanjaro approach in real, in FG not much different. Do you use TerraSync? If so, try a flight around Hawaii! Take off from PHNL in a light aircraft and head west until you hit Pearl Harbor; a right turn north will take you post the USS Arizona Memorial, and the Punchbowl Crater will be to your right. Or, fly east from PHNL past volcanic craters Diamond Head and Koko Head. 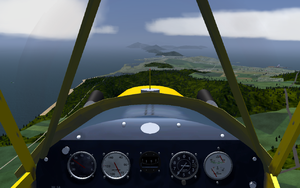 If you follow the O'ahu coastline north from Koko Head, you can land at either old World War II airbase Bellows Field (now a wildlife reserve in real life) or at Keahole MCAS. For a potentially more scenic route, fly east toward Molokai, and stay to the north (left) of the island. The northern part of Molokai features huge sea cliffs and a tiny airstrip on the Kalaupapa peninsula - the peninsula being the only respite from the cliffs. A former leper colony existed near the airstrip! Also of interest are the volcanoes on Maui and the 'Big Island' of Hawai'i - flying VFR in a small plane from PHTO to PHKO over the plateau between Mauna Kea and Mauna Loa can be a challenge, as you have to take off from sea level, fly through a pass of 6500 feet, and then drop back down to sea level to land! The Hana coast of northern Maui is also a nice flight - a circumnavigation of Haleakala, starting and ending at PHOG, is quite a nice flight. 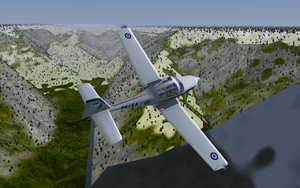 The islands will be available through the download center with the next major scenery release, but for now, fire up TerraSync and your favorite VFR aircraft and have a blast. Published in FlightGear Newsletter September 2010 by Statto. Going from Brisbane International Airport to Sydney International Airport. You should have a heading of about 203. Might take sometime to arrive to this section. Maybe 10-30 mins into the flight. Can't really say but don't give up, you will eventually reach this section of the flight. Your eyes will be rewarded! . This page was last modified on 12 November 2017, at 08:35.